Willow Row Barrow is an extraordinary place – a modern day interpretation of an ancient burial ground, hand built by craftsmen, on land owned by seventh generation farmers. 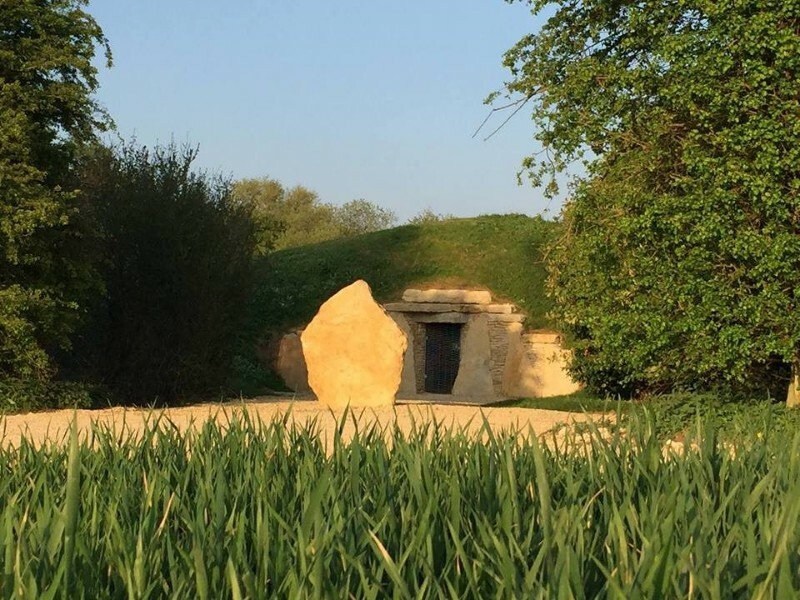 Built by the company Sacred Stones Ltd, the barrow nestles in a spinney surrounded by rolling Cambridgeshire fields farmed by the landowners, Richard and Cordelia Squire. Richard’s ancestor (Sir Peter Squire, royal chemist to Queen Victoria) bought the land in the 19th century to grow herbs for his apothecary business in London, and Richard has worked the land for the last 30 years. The Squires have a deep sense of community, and it was this, together with the opportunity to provide a much needed service, that attracted them to the idea of creating a final resting place for cremated remains on their land. ‘For us, becoming custodians of such a unique monument has been a wonderful opportunity to recreate something very special.’ says Richard. ‘As guardians of the land, we have a deep sense of continuity and look forward to the Barrow being here for many generations to come, in fact forever’. Sacred Stones was formed in 2014 by Toby Angel, Mark Davis, Martin Fildes and Geraint Davies. Martin and Geraint are both master stone makers and they had been responsible for designing and building The Long Barrow at All Cannings Wiltshire, the first long barrow built in Britain in circa 5,000 years. The public’s emotional reaction to – and emotional connection with the Long Barrow has been profound, and this, together with a chance meeting between the four men led to the inspiration for the new company and the building of Willow Row – a round barrow with 391 niches, where up to 1,500 sets of ashes will be placed. If you have never been in a barrow, perhaps you may not quite understand this ‘connection’, but it is a definite, almost tangible thing. There is something profoundly familiar when you step through the doorway – it is like crossing a threshold into a different time and place, somewhere you’ve been before but forgotten until now. A local chaplain described Willow Row as ‘a thin place’ – somewhere where the eternal world and our physical world meet and mingle, and this seems an apt and perfect description. In ancient times, barrows were not just a place for the dead – evidence of feasting found at some sites suggests that the community came together to celebrate and remember their lost relatives. The barrow was a focal point, a place where those who had died were at rest, a place the living were drawn to come back to to connect with them and those who had gone before them. It is a structure designed to reassure, safe from the elements, grounded in the earth and built by the hands of craftsmen using skills passed down for generations. Today, Willow Row offers the same sense of connection to the past. It is reached by walking along a path leading you away from the car park towards something different, something other than the structures we are so used to in our daily lives. As you walk along the field edge and hear the birdsong in the hedgerow, there is a sense of leaving the busy noise of life behind you for a while – it is akin to a pilgrimage of sorts. Walking at a gentle pace for almost 450 yards is enough to clear your mind, to move you from one state of mind to another, readying you for the experience you are about to have. The path perambulates around the edge of the spinney before a gap in the trees opens before you to reveal a large standing stone, the Lady Sentinel, and behind it is the barrow entrance, flanked by other huge honey coloured stones. It looks like it has been there forever. The galvanised steel gate to the barrow is kept closed and locked to secure the precious contents – niche owners are provided with the access code. Visitors who want to see inside can arrange to meet Toby or one of his colleagues and they will open the gate for you. Step inside and the beauty of the dressed limestone structure envelops you. It is like the inside of a beehive, cool and dim but with golden light spilling through the doorway meaning that it’s never completely dark during daytime. There is a pathway around the edge of the circular space and a central passageway bisecting an inner chamber, both flanked with niches from the ground to the top of the walls, some lit with flickering candles. In the centre, the beautiful conical roof is supported by stone lintels and capped with a slab of limestone. A curved seat runs all around each of the walls..
People react when they come into the barrow. Some have cried. Others have laughed out loud. Others just sit quietly and absorb. It is, as we said in the introduction, an extraordinary place. Willow Row is a secular place that is sacred. People of every faith and none are equally welcome here. It is an ancient design built by modern men. It is a timeless building where time ceases to have any dominion. Families who bring ashes here to place in a niche have all day to do so, and they can come back whenever they want. It is a place where those whose lives have ended will be held safe, surrounded by stone walls. It has been created by people who are ethical, talented and passionate, and is cared for by custodians who have a deep rooted connection with the land and the past, and a vision for a better future. It is a place to come back to. It is a place where a community is being created. Providing a beautiful place where families can commit the earthly remains of their dead and feel an ongoing connection to the location. Fundamental to the concept is the sense of community, both for the living and for the dead, and the connection between the generations. Niches can be purchased in advance, and be passed from one generation to the next, thereby providing a lasting memorial for generations within a family. Placing ashes in a niche can be done privately or with a full ceremony – it is entirely up to each family how they wish to do this. The barrow is available for the entire day when ashes are being placed, and there is seating for around 50 people with standing capacity inside for 100. If required a shelter can be made available outside, as can portable loos. There is no electricity supply to the barrow, but portable music systems and live music are welcome. Unlike other burial grounds, Willow Row is only for cremated remains rather than for full burials. This makes it somewhat unique, but we feel that it fulfils the criteria for recommendation as a burial ground nevertheless. The creation of the structure and the sense of timelessness that the barrow imbues is unlike any other site we have visited, and the ethos of the company and the custodians alike mean that this barrow is somewhere of great significance. Opening hours: 9.00 – 5.00 daily, 365 days a year. Your phone call will be answered Toby Angel, Martin Fildes or Beverley Edmeades. Visiting – If you want to come and visit the barrow to see if it is suitable for you, call to make an appointment. Niche owners can come and go whenever it suits them. Accessibility – There is parking at the barrow for visitors with limited mobility. Who can be laid to rest here? There are no restrictions. Willow Row is open to people of all faiths and none. Urn types – Any urn chosen by the family can be used in the larger niches. If a single capsule is chosen, a hand made felt urn is included in the price. (Transferring the ashes to the urn is the responsibility of the purchaser). Locating a niche – All niches are numbered on the Niche Map and each purchase is recorded to ensure ashes can be located easily. Memorials – Sacred Stones provide families with a stone facade niche cover. Personalisation of the cover is an additional cost and can be arranged with the letter carver, Louis Francis. Pricing – A single capsule can be purchased for £1,950 for a 99 year term. Niches with capacity for two or more sets of ashes can be purchased for shorter periods of 15 or 25 years as well as the long term of 99 years, providing families with the option of moving the ashes to another barrow in the future if they wish. Costs for a niche are £1,500 for 15 years, £2,750 for 25 years or £4,800 for 99 years. The largest niches have capacity for 5+ sets of ashes and cost £7,000 for 99 years. Tenure – At the end of the term, the company will contact the next of kin or executor advising that the agreement is available for renewal. If the agreement is not extended, in the absence of any other instructions and after a period of 3 months, the urn(s) may be removed and the ashes strewn in a marked area within the barrow’s site. Ashes will always be scattered on or around the barrow. Long term security – There are covenants in place on the land ensuring the barrow’s future is secure. In addition, the custodians of the barrow are the seventh generation of the family owning the land and are looking toward the future. Website – Beautiful website with information and background to the barrow. Prices online. Client support – Excellent. The people involved with the barrow are all genuinely nice, with a dedication and emotional connection with what they do. The intention is to develop a community of people who have a family member placed in a niche, with member only events to celebrate life taking place in Willow Row as time goes by. Parking – Plenty of parking at the entrance to the land. 3 spaces close to the barrow for disabled parking. If you are looking for somewhere special for the ashes of a person who has died please go and visit Willow Row. We have watched the barrow develop from the early days of the build in 2016, and knew that it would be somewhere very special even when it was just a few rows of dusty limestone. Willow Row feels like it was always there, it has settled into the landscape and blended into the background in the spinney beside the brook. It has a feeling of permanence and safety, a refuge from the world, where visitors can spend time remembering and reflecting, and re-emerge into the daylight with a feeling of completion. The barrow is a truly great achievement by Martin, Geraint, Toby and Mark. It will be a legacy for generations to come and a place of pilgrimage for families from across the country who come to belong to it.